Jantastic 2016 is over! The champions of the banked track all-stars are once again My Little Ponies, who battled through two days of tough competition in San Diego to take the title for the second year in a row. Before we get to the scores and recaps, first some news on the condition of Bay Area Derby’s Demanda Riot, playing this weekend with The Rejects. On Saturday, she went down with a severe injury to her right ankle. Yesterday, Bay Area released an X-Ray of Demanda’s ankle—or at least, what’s left of it. There is not yet an indication of how long she will be off her skates, but we’re guessing it’s going to be a while. 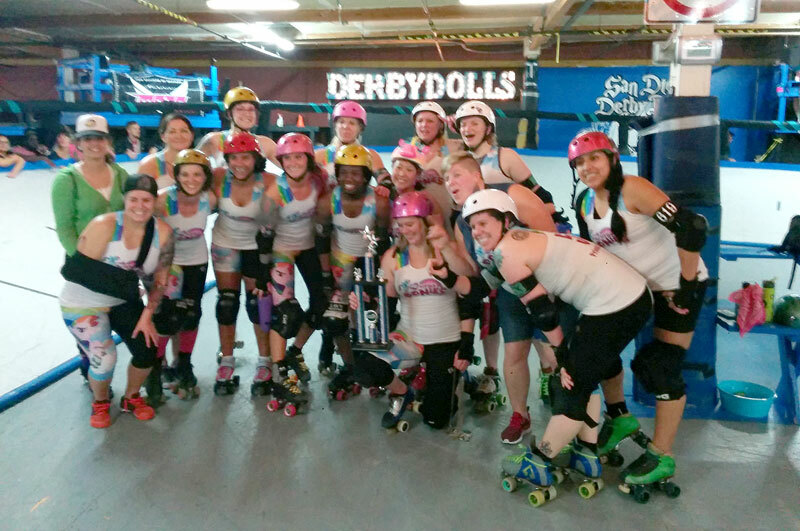 Roller Derby Notes wishes Demanda Riot all the best as she starts the road to recovery. In happier news, San Diego Derby Dolls has confirmed that the Jantastic Invitational will be back to open the next year’s roller derby season. Save the date! Jantastic 3.0 begins on January 14, 2017. With that, here are the blow-by-blow details from Day 2 of Jantastic 2016. The first game of Sunday’s play was supposed to be a semifinal, but with events of Saturday causing one game to be cut short and another to be rescheduled, there was some unfinished business to attend to. The remaining pool game would determine who would get to keep playing and who would be finished playing, essentially making it an elimination contest not unlike a tournament semifinal. 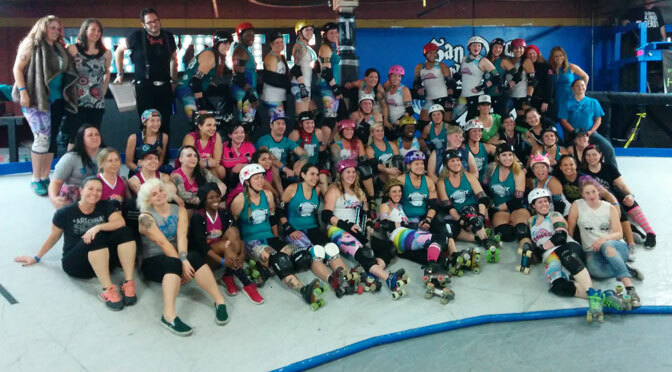 The first half was relatively even during regular jams, with each team splitting the number of lead jammer pickups. On power jams, The Rejects would score the bulk of the points. Killo Kitty scored 23 and Atomic 16 in the first 14 jams of the game, mostly on solo runs. Goody Goody Bloodrop and Hollyhood got in some full passes for Southwest when they got the lead to keep within striking distance. In the last jam of the first, Killo Kitty picked up two penalties. With two other penalties picked up in an earlier jam, that caused her to foul out, leaving The Rejects with a major piece missing from their jammer rotation. It also made the 39-20 halftime score much closer than it appeared. The Southwest could not capitalize. The first two jams of the second half had the jammers of both teams commit penalties, either of which could have turned into a power jam had one of the jammers skated cleanly. Goody had two strong jams to pick up 19 more points, but any hopes of a comeback were squashed late when the Smackdown gave up two power jams in succession. Their defense was able to hold back the Rejects relatively well, but by then there just wasn’t enough time to make up the difference. As the whistle blew to officially end pool play, The Rejects won 81-57. They finish 2nd place in the PM pool and got to face My Little Ponies, the AM pool winner. Southwest Smackdown heads back to Arizona with one win on the weekend and a 3rd place pool finish. Though both teams had their fair share of power jams to work with, the difference in this one came down to the Wolfpack’s dominance during regular jams. After an early sequence that had the teams trade a run of power jams back and forth, Wolfpack was leading 16-10. Mota Matrix came to the line, then proceeded to turn on the jets to crush a 13-0 regular jam win for Wolfpack. That would make up the majority of the difference heading in to halftime. Another set of canceling power jams and a small run by the RDCL made it 48-28 at the break. Hartlyn! gave the RDCL All-Stars a shot in the arm at the start of the second half with a 10-0 jam win over Licker N’ Split. However, the 53-38 score at that time was as close as RDCL would get to the lead. Snot Rocket Science would return serve with a 10-0 win of her own shortly thereafter, and the Wolfpack would continue to dictate the pace on normal jams picking up single-pass wins and denying the RDCL from making inroads. The RDCL would score well on their power jams chances when they had them, but they only were good enough to cancel out Wolfpack’s PJ opportunities. In the end, they couldn’t match the Wolfpack jammer-to-jammer. A desperate 19 point run by the RDCL in the last three jams was too little, too late, as the Wolfpack won 93-69 to land a spot in the championship game. At halftime, the score of this game was 69-6. Team My Little Ponies was cruising to another easy victory. Over the course of five jams early in the second half, five My Little Ponies players fouled out. Their top jammer, Erin Jackson, found herself at 3 penalties, one trip away from the foul-out threshold. With a significant portion of the game still left to play, the result of the game was thrown into question in spite of how far behind The Rejects found themselves. The comeback started right away, with Killo Kitty cashing in a power jam for 8 points. Although My Little Ponies would get those points right back over the next two jams, the MLP meltdown well and truly started when Raven Seward got frustrated over a call and picked up two insubordination calls in quick succession, immediately putting her over the limit and out. The Rejects would turn her penalties and the others into five consecutive jam wins, including a 14 point power jam by Killo Kitty in a 2-2 micropack. The score was 77-49 after that, and given the state of the My Little Ponies bench, there was a sense in the building that the lead was still not safe. Frightmare looked as if she would extend the scoring streak, picking up lead in Jam 22 for The Rejects. Crowe had other ideas and came storming out of the pack behind her, sneaking by to steal lead status and win the jam 4-0. That only stopped the bleeding temporarily, however, since Crowe cut the track. Hunnie Brasco and The Rejects went on the power jam, where they scored an unfathomable 15 points. This put the score at 81-64 with time left on the clock for two more jams. Thankfully for the Ponies, it was a power jam for them as Hunnie picked up a back block during her scoring run. Erin Jackson, who had not scored a single point in the half, brought home a safe 5 points to push the lead back to 22 with enough time left on the clock for one last jam. However, the Ponies were still not completely out of the woods. For the 2016 season, the RDCL made a rule change that requires the leading team to skate a jam penalty-free order for the game to end after time expires. If they get a penalty, and the trailing team does not, additional “penalty jams” would be played. Had The Rejects scored well in the jam, kept out of the box, and forced a penalty of any kind onto My Little Ponies, they would have had another opportunity to finish closing the gap. As time expired, Crowe got out for lead jammer and called off the jam, preventing The Rejects from scoring. However, Boo LaLa was hit with a multiplayer block penalty in the pack, forcing the Ponies to face another jam to try and close out the game. Frightmare would get lead status for The Rejects in the next jam, but so much time had elapsed during the initial pass, no points were scored. With the penalty sheets clear on both sides, the game ended. After all of that, My Little Ponies held on for a bizarre 86-64 victory to set up a rematch with Team Wolfpack in the championship final. Anticipation was high for the special juniors-only game between the best junior skaters in the RDCL, and some of the best from the JRDA. What transpired was a great showcase for youth derby on the banked track and one of the most entertaining games of the weekend. The first quarter was pure insanity. As if the kids were hyperactive on sugary snacks, jammers were flying through packs, bouncing off opponents, and popping up off the track like pinballs in a pinball machine. Blockers were throwing around what weight they had with a high level of accuracy, even amidst the chaos around them. The blocking especially is on point, from both teams. Takeouts have been landed with high precision, and one-on-one blocks strong. Lots of penalties, though. Can't win 'em all. It was clear that the JRDA All-Stars were the stronger team, particularly on the quality of their jammers. Evil Alice and Lil’ RegulateHer, among others, made scoring look easy at times. At the end of the first quarter, the JRDA held a 51-16 lead. Things settled down considerably in the second quarter. The Jr. RDCL All-Stars began to make better plays in the pack, including good blocks from Afro Jamurai in several jams. Though they weren’t able to slow the scoring of the JRDA, the RDCL was beginning to make progress on the offensive side of the ball, helped by a 10-point power jam score by Frank the Bunny. Even so, the JRDA increased their lead to 99-41 at halftime. The RDCL put in their best effort in the third quarter, getting the most points in a period (26) and holding the JRDA to their lowest (32). However, by the fourth quarter, the RDCL was out of gas, not able to keep pace with a seemingly fresher JRDA squad. The JRDA All-Stars would go on to defeat the Jr. RDCL All-Stars 178-83. The game was widely praised as a win-win by players, coaches, and parents from both sides of the isle. The RDCL junior skaters get to taste a higher level of skating, and the JRDA players get to expand their skill set by skating on a banked track. As an appetizer to the championship game, the fans loved it, too. The final came to be a rematch of a pool game that turned out a bit more lopsided than many had hoped to see. A slow start doomed the Wolfpack then, but there was a hope that there would not be a repeat in the full 60 minute feature with the Jantastic trophy on the line. Wolfpack did indeed get off to another slow start — but so did My Little Ponies, relatively speaking. This time, it took them 6 jams to build to a 20-0 lead. After a scoreless Jam 7, it was time for the Wolfpack to do some scoring, going on a 20-4 run through the rest of the quarter. On Jam 12, Snot Rocket Science got lead jammer for Wolfpack, but that status was put at risk when Erin Jackson came charging out of the pack 20 feet behind. Snot gave it everything she had to keep her distance just enough to plunge into the pack and pass one opponent, picking up a point plus two others from the penalty box. However, she called it off a hair too late, allowing Jackson to also get a 3-for-1 score. That jammer duel sent the crowd into a frenzy, with the buzz taking a jam or two to finally die down. It also sent Snot to the box, giving Legs R Us a power jam for My Little Ponies. Some killer defense by the Wolfpack prevented her from getting out of the pack, keeping the score close at 27-20 in favor of MLP. Then Erin Jackson started taking charge. First, she threw down a 10-0 jam win at the end of the first, putting the quarter-time score at 37-20. Coming back from the break, she threw down 14 on a power jam. It would be seven more jams before the Wolfpack would score again, though once they did they would recover with a 24-4 run. It was not enough to counter the deadly jammer duo of Erin and Crowe, however, who combined to score 39 points in the second quarter to put My Little Ponies up 74-49 at halftime. Both teams stumbled out of the locker room to start the third quarter, with 7 of the first 9 jams featuring only one jammer on the track due to penalties. My Little Ponies came out ahead scoring 50 points in 4 power jam chances, while The Wolfpack collected only 20 points in 3 power jam opportunities. This would push the Pony lead to 140-72 with 15 minutes of roller derby left to play. The whole weekend saw players committing penalties at a unusually high rate, and by the fourth quarter it was apparent that the championship game wouldn’t be an exception. As the final frame started, two Wolfpack players had already fouled out and five more were sitting on six fouls. The Ponies also had two foul-outs, with another two on the verge of being sent off. Crucially, one of the My Little Ponies foul-outs was Erin Jackson, who picked up her last two penalties while jamming in the last jam of the third. She had scored 93 of her team’s 140 points thus far. With her out of the game, the Wolfpack threw everything they had left at My Little Ponies in the fourth quarter to try and make a game out of it. After no major change in the score in the next few jams, a string of jammer penalties by the Ponies enabled the Wolfpack to go for the throat. V-Diva scored 28 points in two power jams. Snot Rocket Science had a 13-point play in another one. Brazilian Nut would also contribute with 12 points over two regular jams. Unfortunately, Wolfpack’s penalty troubles did them in. Diva, Snot, and Brazil Nut each picked up their seventh penalty along with their points, fouling them out of the game. The power jams for My Litle Ponies allowed them to pull back 27 points along the way. Mota Matrix, one of the few Wolfpack players still eligible to skate in the game, would add another 19 points in the final two jams. That would help her team win the quarter 72-39, though it was too little, too late. #jantastic #rollerderby FINALS: 🦄 vs 🐺 last jam! In the end, it was another foulfest: Between both teams, there were 152 total penalties, 102 trips to the penalty box, 14 foul-outs, five Wolfpack skaters left on the bench, and an ejection just before the final whistle for good measure. But fun times were had by all, particularly by everyone on My Little Ponies. They had a big enough lead to survive the Wolfpack comeback bid to become the 2016 Jantastic Invitational champions once again, winning 179-144.